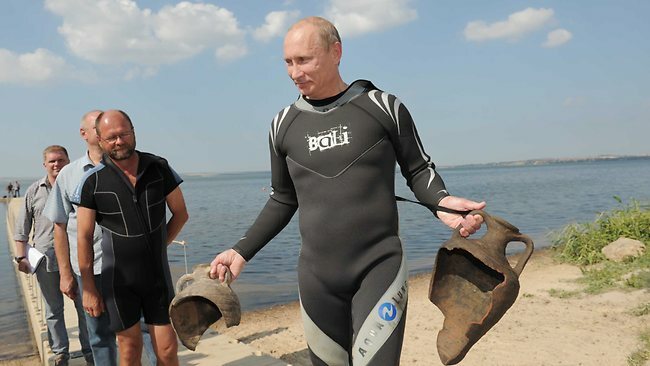 Putin finds amphorae while scuba diving in archeological site. There is even a video. The amphorae were laying there for 15 centuries, waiting patiently until the Russian Super-Premier Vladimir Putin, who in his spare time performs heroics, such as shooting tigers and saving lives, would be around. They skillfully escaped all other archaeologists and divers saving themselves for the one and only – The Russian Leader, and at the right time, exposed themselves (which shouldn’t be surprising – they are not the only ones exposing themselves) to Him, from under layers of sand and/or sea life. They even prepared themselves by cleaning up, lest He swims by them without noticing. Yeah, and those 1500 year-old amphorae are so solid, you can easily lift them by their handles. My god…. unabashed, shameless example of yet another Potemkin Village. Or should we call it Putinkin Villages? Apparently, President Medvedev was impressed by the “free spirit” he found during his visit to California. And now, he wants to “import” it into what Russia hails as their version of Silicone Valley. Best of luck, Mr. Put Medv Putvedev- aside from the choreographed and scripted orgasmic flashes of admiration of Mr. Putvedev himself, the concept of “free spirit” is generally associated with a result of distillery, not a philosophical and social concept. “…in an interview with “Ekho Moskvy,” the Sochi-born Geim — who holds a Dutch passport and works at a British university — said he had no intention of becoming Skolkovo’s poster boy. Yes, this year’s Nobel prize laureates were born in Russia, and while one could credit the education system they went through as the main contributing factor, that system doesn’t exist anymore, and no misguided attempts to resurrect it will help. Unfortunately, “growing your own” would take time, and time-consuming investments are not very popular among politicians.